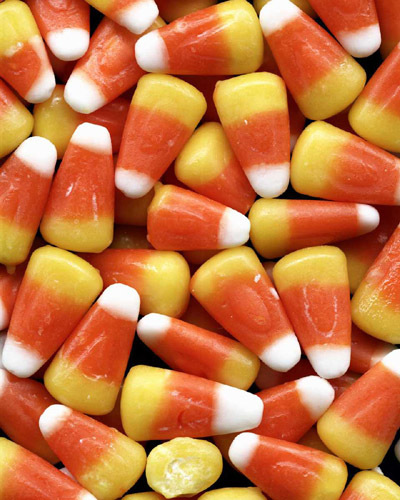 If your house is anything like ours right now, it’ll be clattering with colored candies and shiny sweets, hordes of the things left over from Halloween. I was fretful about letting down any little knockers at our door (let’s face it, no child is happy with a healthy granola bar or vit-boosting piece of fruit proffered due to dwindled sweet stash), so I loaded up on loads of terrible treats. And I do mean terrible. 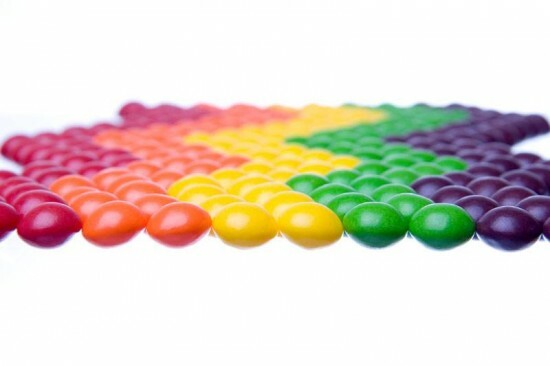 Candied colors like you wouldn’t believe, too-shiny sugar shells, coatings of questionable chocolate… it’s all just a general move to tiny (and adult) tooth abuse. Which means making sweets vanish once the scaring is done is all the more urgent today. Real Simple has come to the rescue with an inventive set of use-em-up recipes. 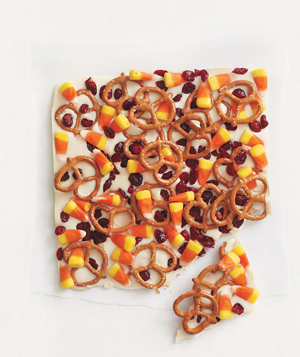 You can stud a sheet of just-soft white chocolate with candy corns, cranberries and salted pretzels. Or blend sweet-sour fruit sweets into a sticky strawberry shake. 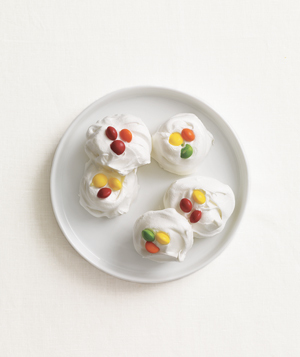 You could shove chopped licorice sticks in with sweet popcorn and pecan halves for a grab-able snack or dot white meringue mounds with rainbow skittles. 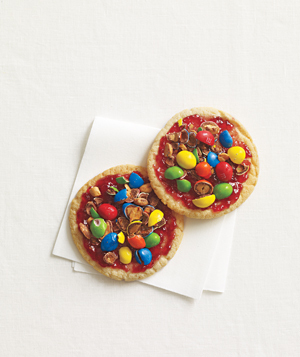 My favorite take on the post-Halloween treat is to slather a cookie with jam before dousing it with handfuls of half-bashed M&Ms. All those saturated, synthetic candy colors are calling out for a Kenneth Noland comparison: this is Mandarin, from 1961. I don’t think I’ve seen a sunnier picture, ringed around by a more gorgeous gold or shining from its center with a hotter orange. 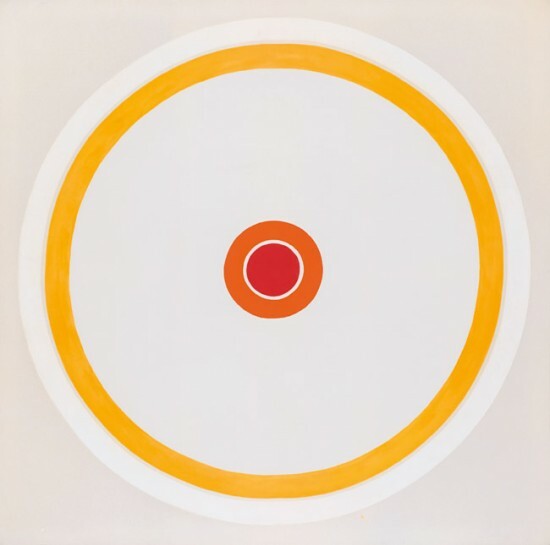 Noland started a series of circle paintings in the late 1950s: they began as indistinct, blur-edged discs but soon became precise, target-like works of concentric circles such as this one, with sharply-defined sides and confident colors. 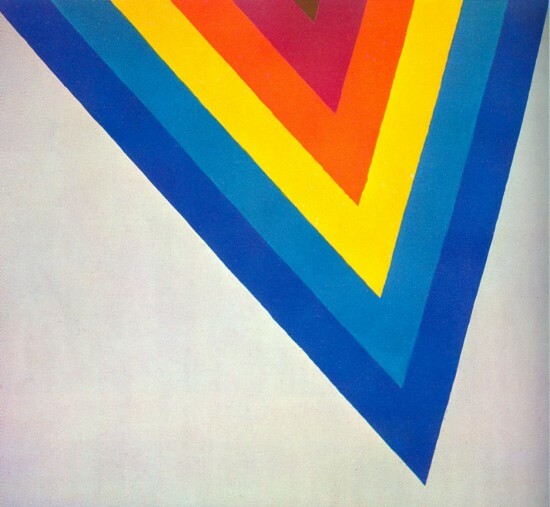 Kenneth Noland (b. 1924) is a painter and sculptor who studied in his native North Carolina and Paris before settling in Washington, DC, where he became a member of the Washington Color School. His clear contours and flat colors also made him a leading exponent of Hard Edge painting (a term coined by an LA art critic to describe abstract painting in which flat areas of color are defined by clean, hard edges). A work like Mandarin is the artist’s answer to the unfocused compositions of Abstract Expressionism (by which he’d been briefly seduced in the late 40s and early 50s). And it sure doesn’t get more focused than this: square meets circles meets galvanized geometry. 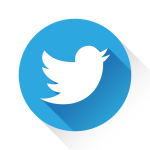 Gradually Noland would evolve to create ellipses, chevrons, stripes and grids, never losing his love for full-on flat color and a slick, clean edge. Which for me makes him look a little candy-like, just here and there. Next > Are You Sitting Comfortably?